The site features a colour switcher which allows the user to apply any one of 8 predefined colour schemes on any individual page or post. It also includes an Event Calendar, Image Gallery, Document Management System as well as a customised slider driven through the Wordpress posts system. 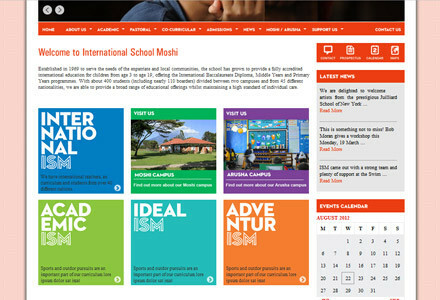 Moshi is an international school in Tanzania, this project involved building a custom WordPress theme based for Face Group based on Neil Holroyd’s designs. The site features a colour switcher which allows the user to apply any one of 8 predefined colour schemes on any individual page or post. It also includes an Event Calendar, Image Gallery, Document Management System as well as a customised slider driven through the WordPress posts system.